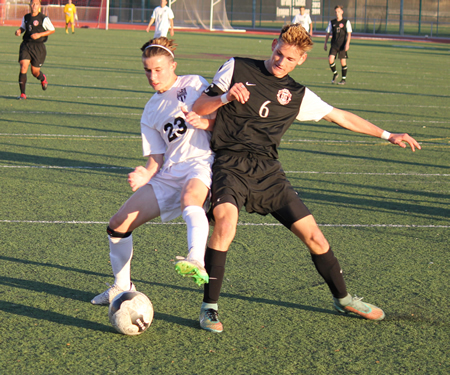 Freshman Carson Cushing battles for the ball against a Hart defender during Laguna’s second round CIF loss on Wednesday, Feb. 25, at Guyer Field. photos by Robert Campbell. After completing 80 minutes of regulation play and two 10-minute sudden-death periods without a score, the squad saw their season end in a shootout on Wednesday, Feb. 25, at Guyer Field to top-seeded William S. Hart from Newhall. The second round Southern Section CIF Division 4 game officially ended as a tie, but the top seeded Indians (23-0-5) advanced after winning the shootout 3-1. Daniel Richards’ team ended the season with their second straight 10-7-5 finish and fourth consecutive winning season. Junior midfielder Chiara Noppenberger catches the goalie out of position and punches the ball past her for Laguna’s only goal in their 3-1 loss to Sierra Canyon in the CIF quarter final on Thursday, Feb. 26, at Guyer Field. 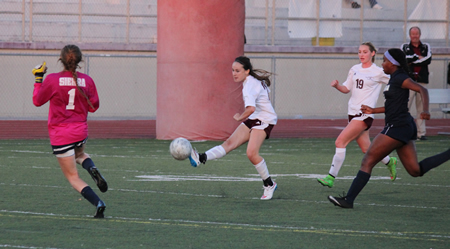 Laguna held the high-scoring Trailblazers from Chatsworth (23-2-1) scoreless in the first half of play last Thursday, Feb. 28, at Guyer Field after the Breakers took the lead with just less than seven minutes remaining in the period. Christine Johnson drilled the ball for the Laguna advantage. In the second half, Sierra Canyon took less than two minutes to tie the score and seemed inspired after that, adding insurance goals at the 25 and 17 minute marks. Breakers still completed the fourth best run in the sport’s 34 seasons at Laguna. Caption: Junior midfielder Chiara Noppenberger catches the goalie out of position and punches the ball past her for Laguna’s only goal in their 3-1 loss to Sierra Canyon in the CIF quarter final on Thursday, Feb. 26, at Guyer Field.